Mr. Saul Gordon is a Certified Public Accountant (licensed in California by the California Board of Accountancy), a Certified Fraud Examiner, a Certified Internal Auditor, and a Chartered Accountant (South Africa). He has over 14 years of professional experience spanning many different industries and that means that SGI Forensic can service clients in different industries and of different sizes. Saul worked for BDO Seidman in the USA, which is one of the largest international public accounting firms and he also worked for one of the largest public accounting firms in South Africa (and so he brings some international experience to his clients). Saul later went on to found SGI Forensic (formerly SGI Consulting), a firm specializing in forensic accounting. Saul was twice-elected as the President of the Orange County Chapter of the Association of Certified Fraud Examiners and served from 2007-2011. The Chapter provides training on fraud prevention and detection to Certified Fraud Examiners, persons interested in becoming Certified Fraud Examiners, and others e.g. internal auditors, people who work for various government agencies etc. 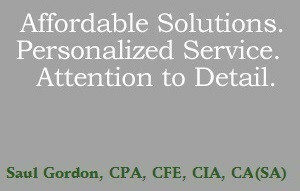 The Chapter is a non-profit organization and is a Chapter of the Association of Certified Fraud Examiners (the "ACFE"). The ACFE is the world's largest anti-fraud organization and premier provider of anti-fraud training and education. Together with more than 60,000 members, the ACFE is reducing business fraud world-wide and inspiring public confidence in the integrity and objectivity within the profession. As President, Saul chaired Board and Chapter meetings and helped to promote the events of other ACFE Chapters as well as the events of other professional organizations. Saul presided over the Chapter's meetings, including an all-day event in September 2008, which included an appearance by Orange County District Attorney Tony Rackauckas. Saul served as a Director-at-Large for the Inland Empire Chapter of the Association of Certified Fraud Examiners from 2009-2012. He served as the Orange County District Ambassador for the Professional Investigators of California from 2008-2011. Saul is absolutely thorough in his work and is known by many people for his attention to detail. Saul personally cares about each of his clients - although he often works with numbers, a client is never just a number to him. With a combination of his experience, credentials and personality, Saul is no push-over as a forensic accountant. See the Testimonials Page. Provided testimony in Court as an expert witness in both criminal and civil trials. He has testified multiple times and has worked on a number of cases that have been in the media. See the Testimonials Page. Detected frauds and detected and prevented possible frauds ranging from petty cash fraud to attempted financial statement fraud. Recommended for implementation various internal controls designed to prevent loss through fraud and/or error, ensure compliance with laws and regulations and prevent costly lawsuits. Elected President of the Orange County Chapter of the Association of Certified Fraud Examiners in 2007 and again in 2009. First elected Director-at-Large for the Inland Empire Chapter of the Association of Certified Fraud Examiners in 2009 and served until 2012. Saul was one of the Founding members of the Chapter in 2009. Elected Orange County District Ambassador of the Professional Investigators of California in 2008. Numerous professional references both from the United States and South Africa. See the Testimonials Page. More references are available on request. Copyright 2008-2017 SGI Forensic. All Rights Reserved. SGI Forensic is not a law firm, is not owned by and does not employ any attorneys and as such, does not render any legal advice at any time and in any manner whatsoever. You are asked to refer all legal questions to your legal counsel. Services are provided in accordance with the terms and conditions of our Retainer Agreement. Accordingly, SGI reports and bases its opinions on facts, which facts and opinions may or may not be in accordance with the outcome(s) desired by a client. SGI does not make any guarantee, promise or other assurance that the same or similar results can be obtained in any matter it undertakes. The outcome of a particular matter depends on a variety of factors including, but not limited to, the specific facts and circumstances of a case, the people involved, the events that subsequently take place (including unanticipated events), etc. Saul Gordon may not be designated as an expert in any matter until there is a signed retainer agreement with SGI Forensic and the retainer and expert designation fees are paid. Any expert designation contrary to this, renders the expert designation fee due and payable immediately, whether or not SGI accepts the case. Website Maintained by Breakout Creations, LLC.